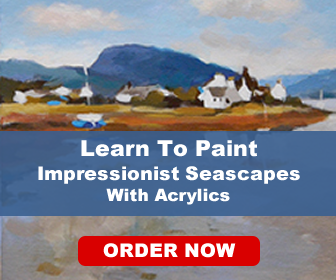 Here is a very helpful acrylic painting tutorial created by Artist and Instructor Bob Davies. Bob has a number of free video tutorials on his YouTube page here, so be sure to head on over after viewing this tutorial. This video tutorial is a well rounded introduction to some of the more popular acrylic painting additives that are available to artists today. These additives change the properties of acrylic paint that comes straight out of the tube. Below is a short description of the items Bob talks about in the video. The first is an additive that you know quite well that you can get directly from your kitchen sink. Its good old water. Water has a couple of different uses when it comes to acrylic painting. It can be used to thin acrylic paint in much the same manner as turpentine thins oil paints. You can also put some water in a spray bottle and use it to spray a mist over your painting while you are working, which will keep your paint workable for longer periods of time. Acrylic Gesso is technically not an additive but it is an important item that you will often see in an art store, so it is worth mentioning here. Gesso can be used to prime the painting surface before you apply the acrylic paint. It creates a surface with a bit of tooth to it which is perfect for acrylic paint. This medium is excellent for creating glazes with acrylic paint. It essentially makes the paint more translucent so that you can see through the paint and the layers underneath. Water has the same effect as the glazing medium but there is a problem when using water. If you use too much water the paint will become too watery and will lose its adhesive qualities. The glazing medium is therefore a better alternative as your paint will not lose its adhesive qualities. Acrylic retarder is a clear, gel like medium that is incredibly useful. It can keep your acrylic paint open and workable for longer periods of time. This medium is your best friend if you are say working in plein air on a hot sunny day as the paint dries rather quickly under those conditions. This is a thick, luscious, paste like medium that is excellent for thickening your acrylic paint and adding texture. You can mix acrylic paints direct into the stucco and apply it to your surface, or apply the stucco first, wait it until it dries and paint over it. You can apply it with a variety of different tools like paint brushes, trowels or painting knives. Yes, you can add sand to acrylic paint! So next time you head to the beach, take some home with you and add it directly to your acrylic paint. It makes the paint somewhat gritty and creates an interesting texture. There is one more very interesting item that Bob talks about in the video below, so be sure and watch it to learn more. I hope you enjoy the video. Happy Acrylic Painting! You can buy all of the items covered in the video online over at my favorite online Art Supply Store, Blick Art Materials. I purchase supplies from Blick all the time. They have amazing prices, great customer service and my shipment always arrives fast and in great condition. Highly Recommended.